Jessica Holler closed out a memorable career by earning her second straight first-team berth on the American Volleyball Coaches Association All-America Team. Senior Michael Sisario made the most of his final season, ranking as the team’s No. 1 runner in the last four meets while scoring in six of his seven competitions. Junior Gabrielle Stravach ranked as the women's cross country team’s top performer in all seven of her meets. Junior Jason McCartney led the men's soccer team with seven goals and 21 points en route to landing First Team All-UAA honors. Senior defender Hannah Meyer closed out her career being named to the All-UAA First Team for the second straight season. 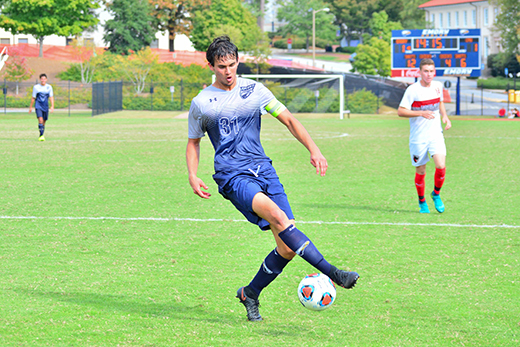 All five of Emory's fall sports teams posted winning seasons, including several trips to regional and national championship tournaments. The Emory volleyball team came through with another outstanding season, finishing with an overall record of 33-6, with the win total representing the 10th straight year of 30 or more victories. The Eagles ended the year ranked No. 2 in the final American Volleyball Coaches Association Top 25 Poll. Emory earned the program’s 21st consecutive trip to the NCAA Division III Tournament, advancing to the national quarterfinals. As usual, head coach Jenny McDowell and her club took on a demanding schedule, playing a total of 14 matches against 12 programs that advanced to the postseason, finishing with an 11-3 record in those contests. 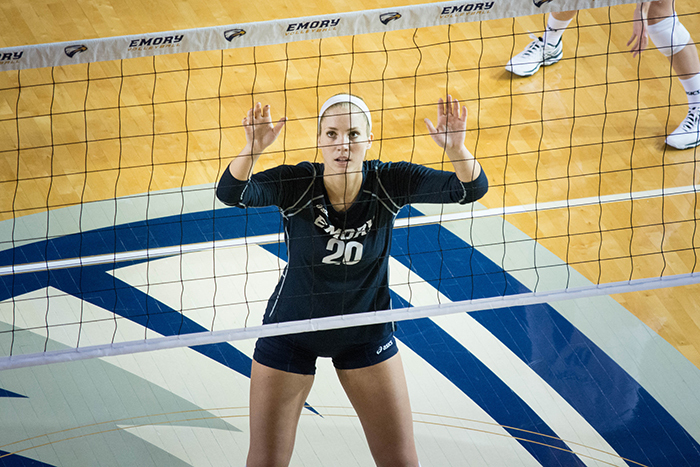 Emory also won the University Athletic Association title for the fifth time in eight seasons, defeating Carnegie Mellon in the title match. Junior middle Jessica Holler closed out a memorable career by earning her second straight first-team berth on the AVCA All-America Team. Holler, who was tabbed as the UAA’s Most Valuable Player, topped the league and ranked fourth in the D-III ranks in hitting percentage (.404). Career-wise, she finished No. 2 on the school’s all-time lists in both hitting percentage and total blocks and 9th in kills. Senior Sarah Maher was afforded first-team recognition on the All-America Team after placing second on the squad in kills, second in digs, third in kills average and third in attack percentage. Sophomore Sydney Leimbach earned honorable-mention acclaim as an All-American. 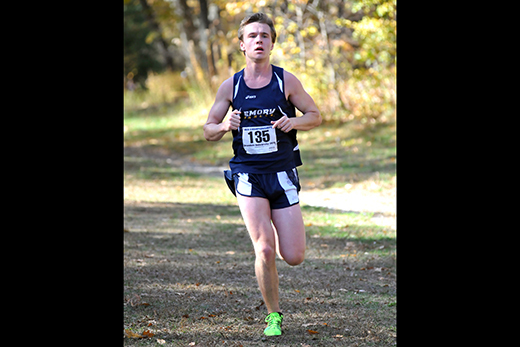 A group of tested veterans spearheaded a successful year for the Emory men’s cross country team, which saw the program earn its third straight appearance in the NCAA D-III Championships. Emory distinguished itself during the year with a 7th-place effort out of 43 teams at the Inter-Regional Border Battle in New Jersey and a fifth-place performance out of 43 entries at the Greater Louisville Classic. The Eagles finished third at the NCAA South/Southeast Region Championships with all of their scorers racing to all-region kudos. Senior Michael Sisario made the most of his final season, ranking as the team’s No. 1 runner in the last four meets while scoring in six of his seven competitions. He earned All-UAA Second Team acclaim and his second consecutive all-region nod. Senior Lukas Mees scored in all five of his outings and was the squad’s No. 2 runner on four occasions. 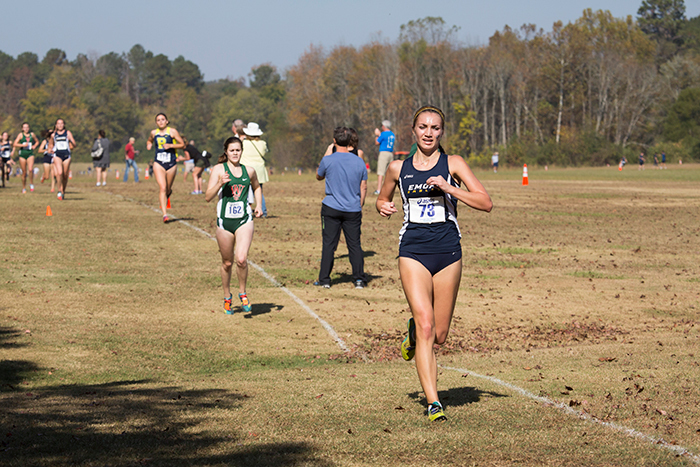 The women’s cross country team maintained its status as one of the top programs in the South, winning the NCAA South/Southeast Region Championships for the third straight year and fourth time in the past six seasons. The Eagles’ top spot at regionals propelled them to their 12th straight spot in the NCAA Championships, where they posted a 24th-place finish. Emory also finished runner-up at the Furman Classic and was third out of 39 teams at the Greater Louisville Classic. Junior Gabrielle Stravach ranked as the team’s top performer in all of her seven meets, highlighted by her 4th-place performance out of 203 entries at the South/Southeast Championships, enabling her to bring home all-region honors. Also included in Stravach’s list of honors was a second-team spot on the All-University Athletic Association Team. Junior Tru Powell was a standout competitor, scoring in all seven of her races while ranking among the team’s top three finishers on five occasions. Powell joined Stravach on the All-UAA Second Team. In addition, Emory's John Curtin was chosen by the U.S. Track & Field and Cross Country Association as the South/Southeast Region Head Coach of the Year for both men's and women's cross-country. The men’s soccer team recorded its 14th season in the last 15 with at least 10 victories, finishing 10-5-1 overall and 3-3-1 in UAA play. The Eagles faced the second toughest schedule in the nation with six teams on the docket reaching the NCAA Tournament, coming away with a pair of wins, including a decision over No. 8-ranked Washington University and a tie in those encounters. Emory was led on offense by junior Jason McCartney and sophomore Moustafa Khattab. McCartney posted team-bests with seven goals and 21 points en route to landing NSCAA South Atlantic All-Region Second Team and First Team All-UAA honors. Khattab was named to the All-UAA Second Team after totaling five goals and four assists for 14 points. On the defensive end, the Eagles were stout all year allowing just 20 goals in 16 games, led by NSCAA South Atlantic Third Team and All-UAA Second Team selection junior Cody Gardiner. 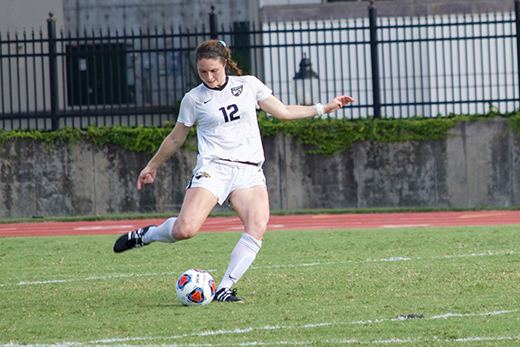 The Emory women’s soccer team notched its 28th consecutive winning season, going 9-5-3 overall. The Eagles faced six teams that advanced to the NCAA Tournament, battling to a pair of triumphs in those contests including outcomes over previously unbeaten No.-4 Chicago and No.-23 Centre. Emory’s final win of the year over Division II Brevard College acted as a milestone victory for head coach Sue Patberg as she became the 56th member of the 300-win club in NCAA women’s soccer history. Senior defender Hannah Meyer closed out her career being named to the All-UAA First Team for the second straight season and the NSCAA All-Region Third Team. First-year student Shivani Beall was recognized as the University Athletic Association Rookie of the Year after leading the team in goals, assists and points. Senior Cristina Ramirez, junior Anna Gurney, sophomore Danielle Darius and first-year student Caroline Kolski added All-UAA kudos for the Eagles, earning honorable-mention status.